TRAIL CAPABLE 50" SIDE X SIDE: With a 50" width, just 2" wider than many ATVs, the RZR 570 goes where other Side x Sides can’t. TRUE ON-DEMAND ALL-WHEEL DRIVE: True AWD gives you the ultimate grip to put that 50" width to work into and out-of corners. It’s the easiest to use and fastest responding on-demand system, automatically engaging all four wheels when you need more forward traction and reverting back to 2WD when you don’t. This means less wear and tear, easier steering, and maximizes power when you need it most. PRECISE, FLAT CORNERING: Front and rear stabilizer bars keep the chassis flat while cornering, letting the suspension do it's job to keep the ride smooth through rocks, ruts and stumps. POLARIS PROSTAR® 570 ENGINE: Purpose-built and powerful ProStar® 570 Engine features 4 valves and dual overhead cam. 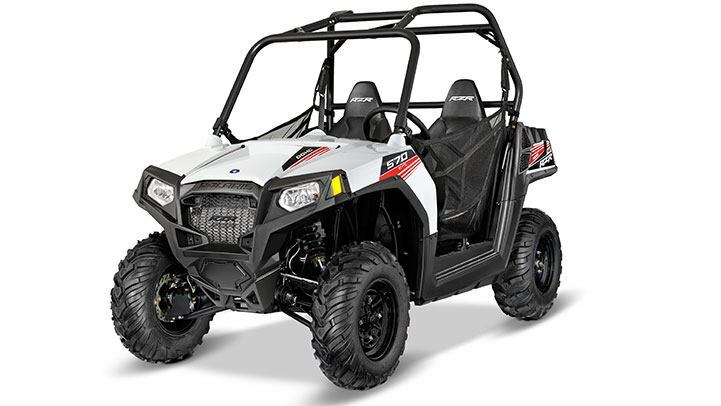 Born from the ProStar® 900 Engine, it features a removable cargo bed panel and a wet sump for easy serviceability. 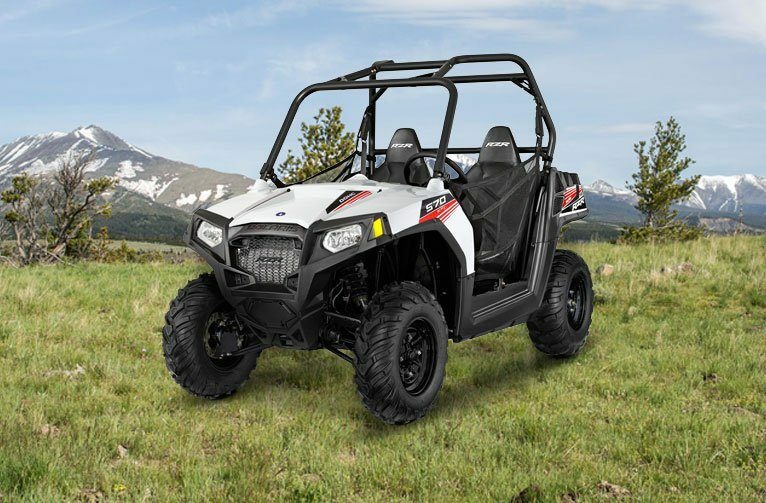 LIGHTWEIGHT TRANSMISSION: Specifically built to optimize power of the Polaris ProStar® 570 engine, its high-torque capacity delivers superior performance and handling. This means more power to the ground, less driveline noise and lighter weight. The innovative lightweight design features a helical cut final drive with optimized gear geometry to maximize efficiency. 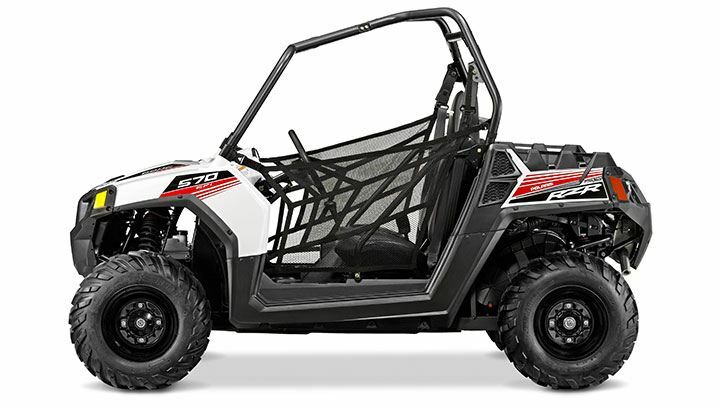 QUICK ACCELERATION: The RZR 570 features a 45 HP ProStar® engine, offering impressive acceleration of "0-35 mph in 4.0 sec"
SUPERIOR FRONT TRAVEL AND SUSPENSION FOR THE TRAIL: With 9" of suspension travel in the front and pre-load adjustable ZF Sachs Shocks. 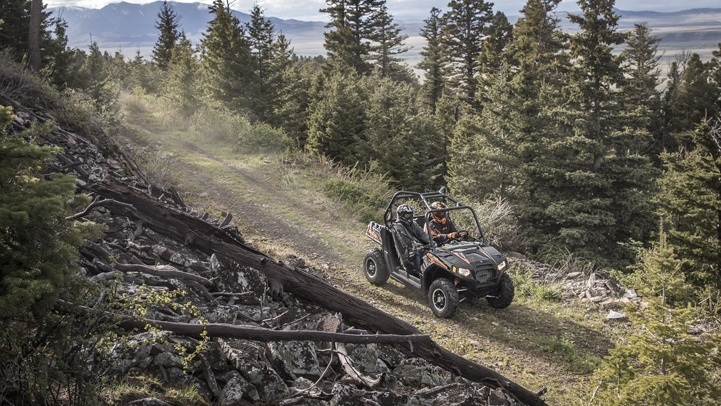 Combined with the front Dual A-Arms and you've got a performance based machine ready to tackle the trail. UNMATCHED REAR TRAVEL AND SUSPENSION FOR THE TRAIL: Ultra smooth riding independent rear suspension (IRS) with specifically designed geometry that provides 9.5" travel in the rear, with pre-load adjustable ZF Sachs Shocks, this machine is delivered ready to hit the trails. 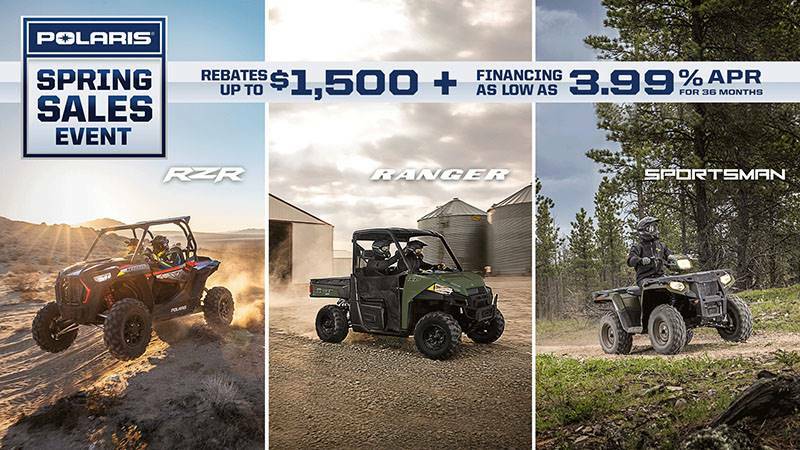 LONG WHEELBASE AND INDEPENDENT REAR SUSPENSION FOR A SMOOTH RIDE: RZR® 570 features a 77" long wheelbase paired with front and rear Dual A-Arm suspension for the ultimate in trail performance. The ride is enhanced even more with legendary Polaris independent rear suspension (IRS), taking the bite out of those bumps and rocks in your path.